Back in 1999, Florida State jettisoned future Deadskin Laveranues Coles for being an accomplice to a crime with eventual BCS National Championship Game MVP Peter Warrick when the two purchased over $400 worth of clothes from a friendly cashier who charged the two a mere $21.40. The move earned FSU the moniker of “Free Shoes University” courtesy of the Ol’ Ball Coach Steve Spurrier. 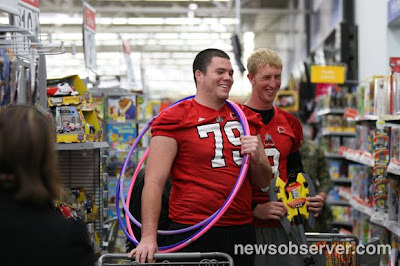 Here’s the real scoop: The N.C. State football team bought toys as part of the annual Toys for Tots Shopping Spree at the Wal-Mart in Garner Monday December 6, 2010. Ten team members spent $24,440 on toys and gifts which was part of the almost $50,000 donated by Wolfpack fans and Coca-Cola to the Marine Corps Toys for Tots campaign. There was a competition between the players to see who could spend the most. For three years N.C. State's Josh Czajkowski has won, but this year Wayne Crawford took the title, spending $3640. 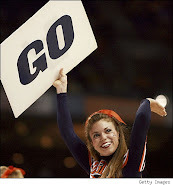 "We are excited and happy to get involved this way" said Crawford.